UFC 127 is getting double treatment from UFC. It will not only just stream two of its prelims on Facebook, but fans will also see it on ION TV. 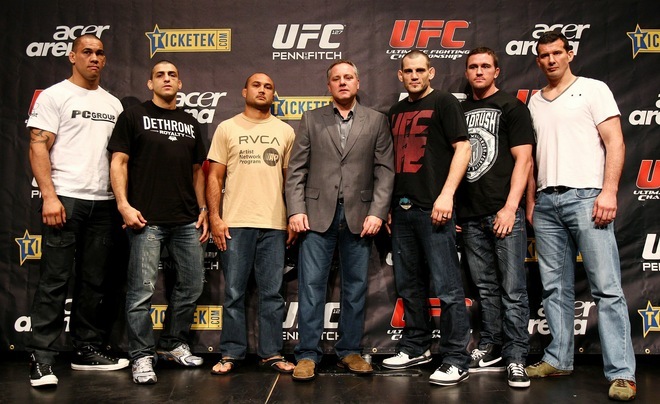 The biggest MMA organization, UFC, is expanding to several new outlets to deliver more fights to its loyal supporters. UFC recently teamed up with Spike TV and Facebook to stream 12 UFC Prelims Live events. Two UFC 127 fights will stream on Facebook. These fights are the ones involving Anthony Perosh versus Tom Blackledge and Jason Reinhardt versus Tiequan Zhang. But the surprise doesn’t end there, when Spike TV didn’t get the opportunity to air prelim fights from UFC 125, UFC big boss, Dana White turned to broadcast network ION TV to air three bouts. Also, for UFC 127, Ion will again air three fights on their network. ION will be airing three UFC 127 preliminary bouts leading up to the pay-per-view broadcast. The fights include: Light heavyweight James Te Huna will fight Alexander Gustafsson, “Ultimate Fighter Season 9″ winner Ross Pearson battles Spencer Fisher at lightweight, and Nick Ring locks horns with Riki Fukuda in a middleweight contest. The UFC 127 Prelims on ION Television will begin at 6 p.m. PT / 9 p.m. ET. The preliminary bouts streaming on the UFC’s Facebook page will begin at 5 p.m. PT / 8 p.m. The UFC 127 fight card is complete. Are you ready for some Penn-Fitch action this weekend? The biggest and most prestigious MMA promotion will cross the seven seas for its come back to Australia. 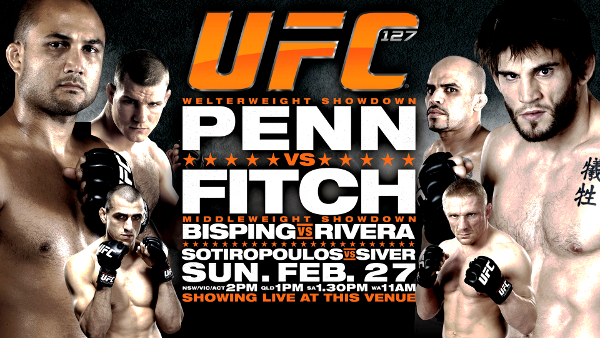 This Sunday, February 27, BJ Penn and Jon Fitch will face off on the much awaited UFC 127: Penn vs. Fitch. Winner on the said event will bedeclared the No. 1 contender for the welterweight title currently wrapped around Georges St-Pierre’s waist. The live event will take place this Sunday, and will air live on Saturday at 7 p.m. PT/10 p.m. ET.